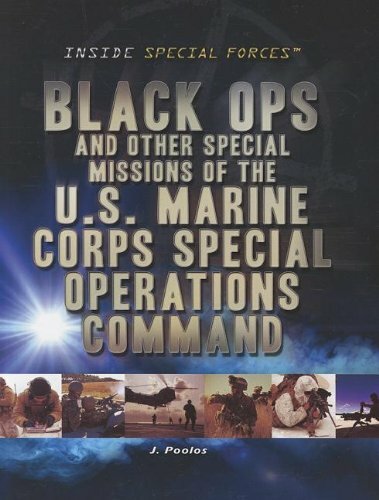 Describes the special forces operations of the United States Marine Corps, details the weapons and equipment special operations units use in the field, and profiles some of the most famous Marine Corps missions. Gr 5-7–Readers who enjoy learning about the military will be pleased with these volumes. Each title describes the general mission of its titular group, including the qualifications needed to join, training, and a narration about assignments. Unlike many books that cover similar subjects, these texts have enough content and substance to make them valuable beyond being browser-friendly items. The font color and backgrounds vary from black on gray to white on black for the main information, with sidebar facts presented in white on dark green. Almost all of the pages have a dark border. Color and black-and-white photos are used judiciously, and the captions are informative. Glossary words are not noted in the text. Pair this series with Capstone's “American Special Ops” (2013).–Eldon Younce, Anthony Public Library, KSα(c) Copyright 2013. Library Journals LLC, a wholly owned subsidiary of Media Source, Inc. No redistribution permitted.